We haven’t been blogging as much this summer, because we’ve gotten wrapped up in grandkids and other fun stuff. So the whole genre of “crafting” has taken on some new meanings for us. Nana (in need of a hearing aid): Did you say you want to play Minecrap? Grandpa: Why do you like Minecraft? Grandkids: It’s a fun game. Grandpa: Oh, you’d like anything that had craft in it. How about poopoocraft? Grandkids (chorus of giggles): Nooooooo! And then, for the older grandkids, and their parents, who still have the kid mentality, there’s Pokemon Go, or as a daughter explained, “It’s the best of both worlds, a video game and an outdoor game!” Carl Jacobson made a pokeball on the lathe for a recent project, even though he said he had no idea what it was for, it was still a fun project! See his video-post here. I took Art History from Jack Thursby, back in college. One thing I remember from his class is that studies show during times of war and uncertainty, art in those periods tends to be more into escapism and fantasy. The models’ beauty or resemblance to animals or mythology is exaggerated. When civilization is stable and people are doing well, art tends to be more realistic. Maybe we’re going through another wave of Romanticism vs Realism, as in the second half of the 19th Century. We’re hoping some of the turmoil all around us eases up in time. After the national election maybe? Doubt that. 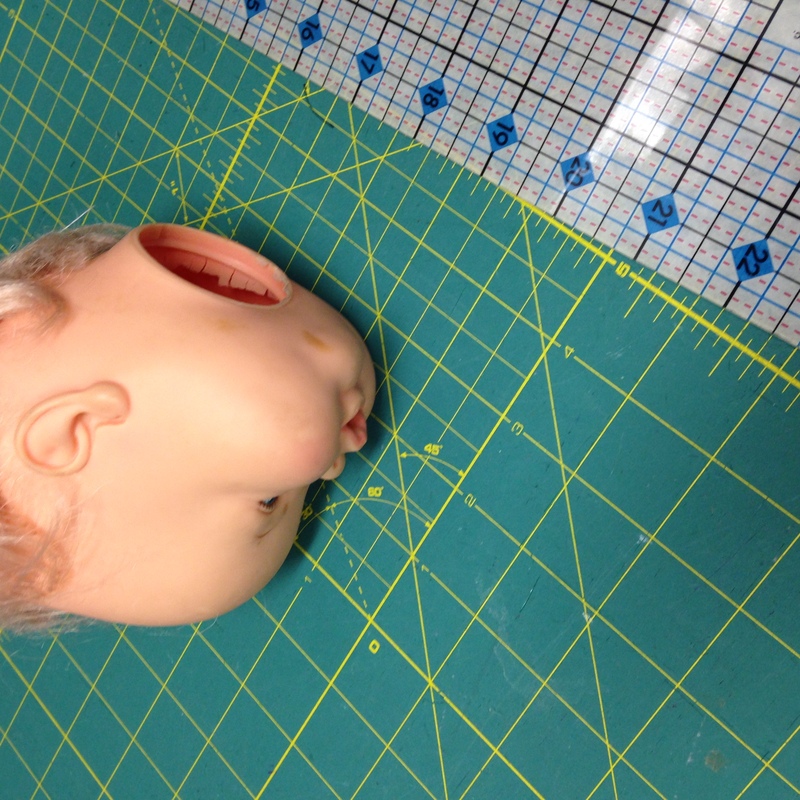 This is the head of a Joey Stivic doll. I once bid on a miscellaneous lot of dolls and doll accessories on eBay, and ended up with this and a few other creepy dolls: a Cabbage Patch Kid in a T-ball uniform with yarn hair and a plastic ball cap, a Napoleon Dynamite dancing figure, a couple of doll chairs. If you remember the 70’s sit-com All in the Family, Joey Stivic was the child of Meat-head and Gloria, and grandson of Archie Bunker and Edith. The doll was “anatomically correct” and had a handkerchief pinned on it as a diaper. The grandkids pulled its head off and every once in a while I find it kicking around the house. I had to hide the Cabbage Patch doll deep in a closet, because one of the grandkids couldn’t sleep in the playroom as long as it was in there. Whether you prefer art and leisure activities to be on the Romantic end of the spectrum or the Realistic end, let us not be paralyzed by the uncertainties and chaos going around us. Hoping our families and communities pull together and can anchor us, so we can feel inspired to continue to exercise our creativity.